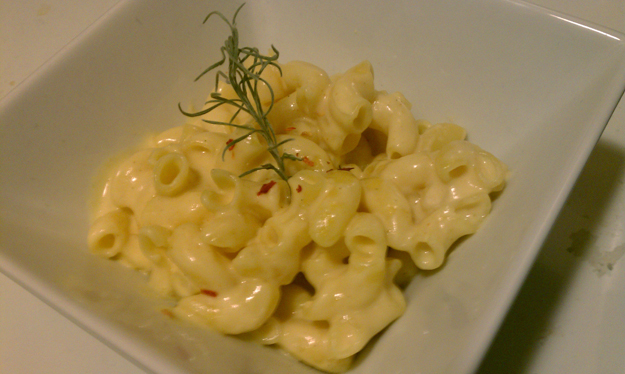 Home > Recipes > Mac & Cheese, Cheese Wench Style! Mac & Cheese, Cheese Wench Style! Springtime is coming, and with it usually comes some rainy days. This past week a rainy afternoon made me crave some warm cheesy comfort food. Of course, one of my favorites is a good Mac & Cheese. Now, before you reach for the blue box, have a look at just how easy it is to make a tasty cheese sauce from scratch! Never tried it before? Here are a couple of things to remember before you start. Starch is your friend. Why? Well, because curdled cheese does not make for a tasty & delicious sauce. Starting with a bit of starch not only makes for a richer texture, but helps prevent curdling. Also adding the cheese last, and cooking it just enough to melt (usually you can remove the pot from the heat and just allow the residual heat to do the job) can prevent problems as well. Why wine? Not only can it add nice flavor, but the acid in white wine can help keep cheese from getting stringy, which is also not so great in what’s meant to be a smooth creamy sauce. Not looking for the flavor of wine in your dish? As little as a Tablespoon should do the trick, or a squeeze of lemon juice will work as well. In this recipe I added a bit of red pepper and curry powder just for fun, but you can replace them with anything that sounds tasty to you. For example, use apple wood smoked cheddar and add some smoked paprika; or try some diced chiles, onions, tomatoes and some dried chipotle for a southwestern flavor. Fresh herbs are also great additions. Bring a large pot of salted water to a boil. Add the macaroni and cook until al dente. Drain the pasta and rinse with cool water to stop it from cooking further. Melt the butter in a heavy 3-Qt sauce pan over medium heat. Add the flour. Cook 3-4 minutes, stirring constantly. Do not let the flour brown. Using a whisk, add the milk slowly in a steady stream, whisking constantly. Cook (still whisking) 4-5 minutes until the sauce is thick and smooth. Remove from the heat, and add the wine, salt, curry powder, cayenne, cheese and red pepper flakes. Stir well to melt the cheese. Toss with pasta and serve. Amanda Simcoe is a chef and food connoisseur. She absolutely loves good food and appreciates the art of cooking and trying new things. Also known as “The Cheese Wench,” she knows most everything there is to know about cheese. She loves using fresh ingredients and has a huge garden where she grows much of her own produce. Amanda also enjoys making beer at home and cooking elaborate meals. Lunch Today at Sage Rage Melt Bar on Brookside = WOW!